I didn’t plan on making this pork tenderloin recipe. It happened out of desperation. 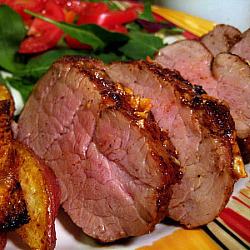 I originally planned on making this Fennel Rubbed Pork Tenderloin with Roasted Fennel Wedges. I bought all the ingredients for it and everything. Then I found out that my husband hates fennel – how did I never know that? I said “too bad, I’m making it anyway” but then the recipe would not load on Epicurious and it’s not in The Gourmet Cookbook. I looked everywhere online for it with no luck. It was 8:30 and I had to start something for dinner. I was hungry and cranky. I begged Brandon just to take it out and grill it but he refused…it was freezing out. I sulked off to The Gourmet Cookbook and began browsing through the pork tenderloin recipes. I was pleased to find Island Pork Tenderloin. It sounded like something we would love. I will honestly say that I’m happy our original recipe didn’t happen because this Island Pork Tenderloin was wonderful. The spice rub is a great combination of warm flavors and the glaze is such a nice finish with brown sugar, hot sauce and garlic. Sounds strange but it totally worked. Also, I love recipes where I can start meat in a skillet and finish it in the oven. It frees me up to prepare the side items. I served this with roasted potatoes, salad and rolls. Stir together salt, pepper, cumin, chili powder and cinnamon and coat pork with spice rub. Heat oil in an ovenproof 12-inch heavy skillet over medium high heat until just beginning to smoke. Brown pork on all sides, about 4 minutes total. Remove from heat. While the pork is browning, stir together brown sugar, garlic and hot sauce. Once you remove pork from heat, spread glaze onto top of each tenderloin. Roast in oven until thermometer inserted in center of tenderloin registers 140 degrees, about 20 minutes. Tent with foil and let pork stand in skillet at room temperature 10 minutes. (Temperature will rise to about 150-155 while standing.) Slice and serve. That spice rub sounds like one I use for salmon sometimes – always delicious on that too, but I’d like to try it on the pork. Your photos make me want to grab a fork. 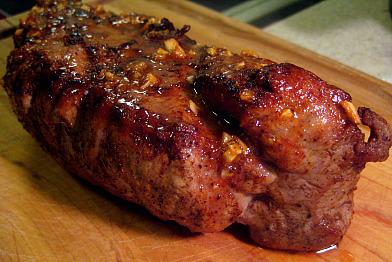 This pork looks perfectly cooked and the spices sound delicious! I will definitely be making this. Found this on Epicurious years ago and have made it many times for parties – it is always a hit!! This is the best recipe! If you are bored with the standard pork chops and applesauce, try it! just made this AND devoured it! soooo good, thank you. my review is up, thanks again! Mara – thanks for sharing your method for the Big Green Egg! We just moved and got ours back in action and I actually planned to make this dish this week. I’ll definitely have my husband this! So glad you enjoyed! Oh my this is amazing. I just made this but doubled the rub. It’s perfectly moist and a happy flavor. Not too spicy nor too sweet. My boyfriend looked at me and said this is a keeper. Awesome recipe thank you sooo much.